In Yellowstone National Park’s early days, before the cars and tour buses took hold of the park roads (and before there were even paved roads at all), visitors relied on a different kind of transportation; one that defined the old western lifestyle and became a staple of Yellowstone’s rich history. According to Leslie Quinn, an Interpretive Specialist with Yellowstone National Park Lodges, the dilemma they faced back in 1872 after the park’s initial opening was, with mass amounts of people coming to the park via the new railroad system, how could they be conveyed throughout the park? 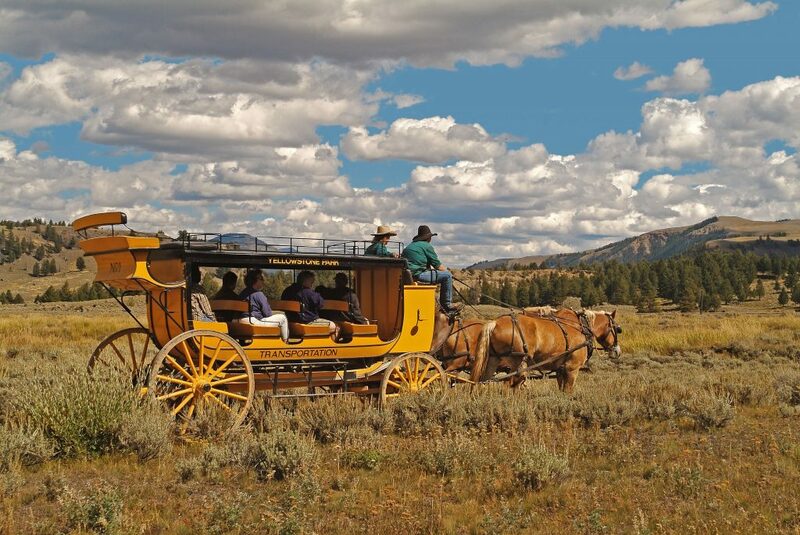 The stagecoaches of Yellowstone are a beloved and timeless tradition, kept alive in the park even today. In fact, one brand new stagecoach was built just last year by our employee, Tony Leftwich. The company offered several models of coaches, modeled and built by the Abbot-Downing Company of Concord, New Hampshire. Some of the most notable models were the six-horse “Tally-Ho” stagecoaches, which transported guests from the train depot stationed at Gardiner, Montana, over the five miles to the Mammoth Hot Springs Hotel. “Tally Ho” stagecoaches featured four interior seats, as well as an exterior rear seat, and even hosted seats on the roof. According to Quinn, up to 36 people could fit on this model of stagecoach. 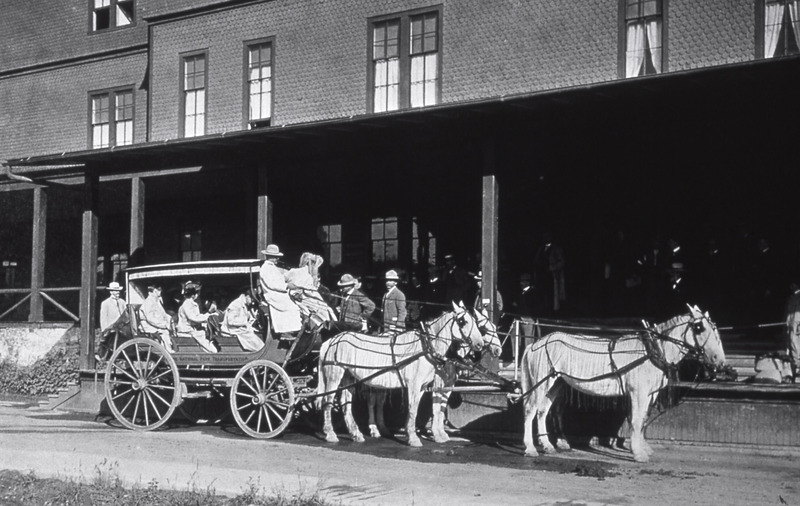 From the Mammoth Hotel, guests loaded onto smaller, Yellowstone Observation Wagons, which were pulled by four horses. These coaches were used to take 10 visitors per coach on the “Grand Loop” tour, where they would ride together for five days viewing the various sites throughout the park. 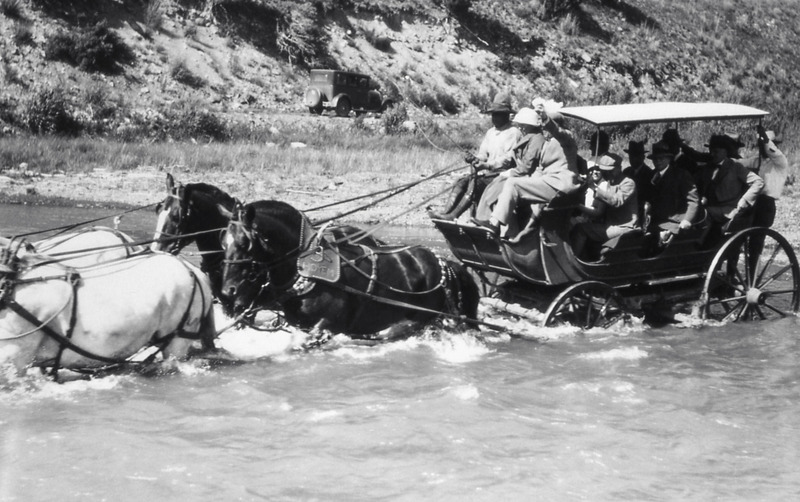 Back then, stagecoaches were the way to travel in Yellowstone. It wasn’t until 1917 that the reign of the park’s primary transportation had shifted, and cars and buses took over the roads. Today, at Roosevelt Lodge, people can experience what it was like 100 years ago and ride on replica “Tally Ho” stagecoaches. Quinn, who has researched Yellowstone’s stagecoach era, said he believes the stagecoaches in the park today help connect guests to the experiences of the past. If you’re interested in experiencing a Yellowstone stagecoach, you can learn more online, or by calling us at 307-344-7311. Additional information on the history of transportation in the park can be found on the NPS website, or by visiting the Yellowstone Heritage and Research Center in Gardiner. For another historic Xanterra adventure, take a ride on the Grand Canyon Railway. The lovingly restored classic train offers an incomparable historic ride to the Grand Canyon through the ponderosa and piñon pine forests and wide-open prairies.